Mark Thoma, while linking to an article on the cost of land use regulation, expresses doubt about the idea that land use regulations contributed to the housing bubble by raising housing prices. So I guess this is as good a time as ever for me to make the case that land use regulations probably contributed to the housing bubble. I developed a strange interest in this subject in grad school when I took an urban economics class, and I've more or less kept up with the economic literature ever since. To be clear, I'm not saying that land use regulations definitely did contribute to the housing bubble. 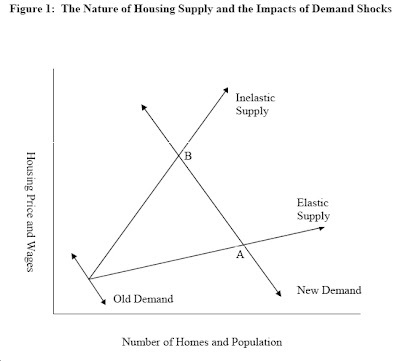 I'm only saying that based on the existing empirical literature on the relationship between land use regulations and housing prices, it's likely (very likely, in my opinion) that land use regulations contributed to the housing bubble in a not-insignificant way. The most persuasive evidence comes from a 2006 paper by Min Hwang and John Quigley, "Economic Fundamentals in Local Housing Markets: Evidence from U.S. Metropolitan Regions". Hwang and Quigley's model is based on data from 74 metropolitan areas (MSAs) from 1987-1999. 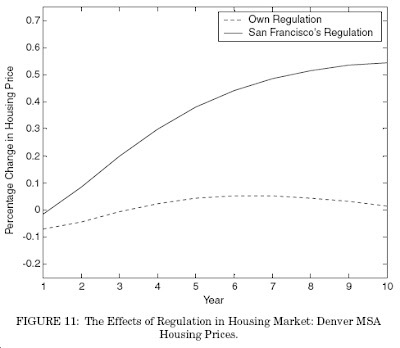 Using a well-known Regulation Index (developed by Stephen Malpezzi), which measures the restrictiveness of an MSA's land use regulations, Hwang and Quigley are able to simulate the impact of restrictive land use regulations on housing price appreciation across MSAs. As Hwang and Quigley explain, "After an initial shock, lagged market responses play an important role in the development of equilibrium prices." "This simulation is reported in the same manner as those reported for Houston, Tuscon, and San Jose. We also report a second simulation for Denver, but with one counterfactual. In this second simulation, we assume that Denver's regulation of new construction is as stringent as that of San Francisco, the market with the most stringent building regulations in our sample." As you can see, more restrictive land use regulation leads to larger and more sustained house price appreciation. "To identify metropolitan areas where the supply of housing is constrained, I assemble evidence on housing supply regulations from a variety of sources. In places with relatively few barriers to construction, an increase in housing demand leads to a large number of new housing units and only a moderate increase in housing prices. In contrast, for an equal demand shock, places with more regulation experience a 17 percent smaller expansion of the housing stock and almost double the increase in housing prices." The fact that the house price appreciation in MSAs with restrictive land use regulations is so long in duration would give realtors and homebuyers the impression that (stop me if you've heard this one already) "housing prices always go up!" In other words, the sustained house price appreciation lays the groundwork for a speculative housing bubble. The length of the price appreciation, I think, assures people of the stability of the upward trend, thus inducing them to borrow over their means in order to buy. That's my take, anyway. I really just wanted to write it down. there is another report that say Denver have strong regulation. how can you know if ragion or city apply those regulations or not? All you are demonstrating is that regulation forces the supply curve to be steeper. Well, so what? Subprime borrowers typically are not the ones purchasing homes, so even if the housing prices are sky high, they are never going to fall back down to zero, not even close. Your argument seems to be that the homes are priced incorrectly, but they are not. Why would a rational homeowner want it to be easy for a developer to spread low budget metastasies all over the neighborhood and have flood control problems to boot (since we've decided land use regulations are a fool's errand)? Gentrification is a GOOD THING. If you want affordable, mass housing, look to a socialist country where they all look alike and have the same, zero-amenity features. That's what you have in store if you throw out land use regs. Oasis is, in fact up may appear the 8 Violet names. Thank you for sharing. You can also have a try of Diablo 3. It's really an interesting game. interviews. I'm a editor of game site, you can visit and find diablo 3 gold, i like it very much. Thanks for the post that was so very informative, I’ve learned a lot. Keep up the good work.Billiges Smartphone ohne Vertrag online kaufen I need more information about it can you do that? Thanks. Thanks for the post that was so very informative, I’ve learned a lot. Keep up the good work.Günstiges Smartphone ohne Vertrag online kaufen I need more information about it can you do that? Thanks.